Sunrise in central Tanzania’s Ruaha National Park, where guests at Jabali Ridge, a new high-end safari lodge, often break from their morning game drive to have breakfast under a baobab tree. The East African country hasn't always had the best conservation record, but now that's changing. And just as wildlife sightings improve, luxurious new lodges are making spectacular, unspoiled parks more accessible. The instant the door opened and we stepped out of the plane, I took a deep breath. We had just touched down on a dirt airstrip in Tanzania's Ruaha National Park, and the air around us smelled of warm wood. The sky was immense; beneath it lay a primordial landscape of chest-high elephant grass, stubby baobab trees, and, in the distance, haze-clad hills that seemed to melt into the bright horizon. Waving goodbye to the pilot, we walked a few yards to a waiting safari truck, its sides completely open. My wife, Courtenay, slid in next to me, and our two boys — Asa, five, and Apollo, eight — hopped in front. At the wheel was Moinga Timan, a young Masai guide with a smooth, oval face and two notchlike scars on his left cheekbone. Off we rumbled down a deserted sandy road, the savanna rolling away on either side like a dry, endless ocean. After about 15 minutes, Timan suddenly turned onto a narrow track. We threaded through tangled thorn trees, leaning in to avoid getting scraped, our luggage bouncing around behind us. Up ahead, a gnarled old sausage tree loomed, casting a dense pool of shade on the ground. As we approached it, Timan turned and put a finger to his lips. I could feel my adrenaline rising as we spotted a dark shape lying on a branch midway up the tree. I stared harder and realized we were looking at a leopard. She was two years old, Timan estimated, and probably the most exquisite creature I have ever seen. Asleep on a branch, head on her left paw, other legs dangling, she looked absolutely serene. Timan cut the engine and we rolled right under her. None of us could take our eyes off her coat. It was a masterpiece, the orange spots so precisely framed by black, it looked as if they had been applied with a fine paintbrush. We all sat in the cool shade looking up, lost in our own thoughts. After a few minutes, Timan put his hand lightly on the ignition key and turned around. I could have stayed there the rest of my life. My family and I recently left East Africa, where I had spent 11 years as bureau chief for the New York Times, and this was our first trip back. No matter how many times I go on safari, the experience is always profound. There's a special peace — and a special thrill — that comes from stepping onto the savanna under an open sky and seeing the most beautiful animals on earth existing in their own space, on their own terms, often against great odds. It is a rare privilege, and never fails to engender a shift in mood, a slowing down, an opening up. We had come to Ruaha National Park and the nearby Selous Game Reserve, two of Tanzania's most pristine tracts of wilderness, to spend a week at a pair of new high-end safari camps. Ruaha lies on a vast, baobab-studded plain, with only a handful of lodges spread over a territory just a little smaller than New Jersey. Selous, where we started our trip, is even bigger. Rugged and bushy, the reserve was once home to one of Africa's largest populations of elephants. Though there are now far fewer of these creatures, and those that remain are a little skittish (more about that later), it's still a great place to spot lions, giraffes, hyenas, hundreds of species of tropical birds, and the elusive wild dog. Neither of these parks is on Tanzania's main safari circuit. You can go for days without hearing another car, so you don't have to deal with other tourists acting like wildlife paparazzi, as they can in other, more trodden safari destinations. Here, you have the African veld to yourself. Well, almost to yourself. Tanzania is in the midst of an epic battle to protect its wildlife, especially its elephants, and all of its parks are haunted by poachers. In the past decade, at least 100,000 elephants across Africa have been slaughtered for their tusks: a crisis driven by China's rapacious demand for ivory trinkets. An underground ivory pipeline runs from the most remote reaches of the savanna, through African ports, where sticky-fingered customs officials are more than happy to turn a blind eye (for the right price), to carving workshops in cities such as Guangzhou. Tanzania — where the people are poor, the wildlife is rich, and the government has historically been deeply corrupt — has lost more elephants than any other country. From left: A leopard seen on a late-afternoon game drive near Jabali Ridge, in Ruaha National Park; drinks around the campfire at Roho ya Selous, a new tented camp in the Selous Game Reserve. But please don't get the wrong impression: as a visitor, you're not in any danger. The poachers operate deep in the bush, and they're not interested in you. With any luck, your visit will help put a few more eyes on the situation — and protect a few more elephants, lions, and leopards. Both the camps we stayed at are run by a Dutch-owned safari company called Asilia Africa, which invests a portion of its profits in wildlife protection and research, bringing resources these areas might not otherwise get. And this is a great time to visit, because the tide may at last be turning. The world's elite, from Hillary Clinton and Prince William to Leonardo DiCaprio, have embraced the elephant cause and thrown a spotlight on the tragedy of the ivory trade. They have named names — China's in particular. The Chinese government recently bowed to the pressure and announced it was shutting down its domestic ivory markets. For the first time in years the price of ivory is falling, a sign that demand for Africa's "white gold" may finally be waning. We had touched down in the Selous at 5 p.m. — that stunning hour when the light in tropical Africa turns the color of whiskey, and the animals come out. From New Delhi, where we now live, we had flown to the Tanzanian capital of Dar es Salaam, and from there caught a small bush flight to the reserve. In order to take advantage of the last hour or so of daylight, our guide suggested we drive to the lodge via Lake Nzerakera, one of many shallow lakes that dot the landscape of the Selous. We parked at the water's edge in the shade of a group of palm trees, their white trunks as smooth as plastic piping. A pod of hippos wallowed so close by I could see the pink of their little round ears, which seemed comically tiny in proportion to their enormous heads. A troop of baboons ran around the beach playing something that resembled tag; the fish eagles and black herons hunting on the shore turned their heads once or twice to look at them. As we watched in silence, I was struck by the sheer diversity of all the forms of life happily sharing the same space. Clearly, our species has a lot to learn. "There’s a special peace that comes from seeing the most beautiful animals on Earth existing in their own space, on their own terms, often against great odds." Asilia's new property in the reserve, Roho ya Selous, is a tented camp without a gate or a fence, totally open to the wilderness — and everything that resides there. It was both wonderful and unnerving to walk over to the dining tent in the dark and hear a lion grunting for its dinner in the distance. (Don't worry, a guard escorts you everywhere after nightfall.) Before our first evening meal, Aidan Kikoti, the Tanzanian camp manager, had asked a couple of staff members to build a huge fire. Settling into canvas director's chairs around the fire, Courtenay and I sipped chilled South African wine while the kids sucked down orange Fantas and we all watched sparks drift up into a rapidly darkening sky. Dinner was served under the stars, and the food was fantastic — especially considering how remote this camp is (the nearest, tiny, town is 100 miles away). We feasted on steak sourced from central Tanzania, Brie made in Kenya, and chocolate mousse that I knew was going to be worth the calories when I stuck my spoon into it and the spoon stood up straight. After waddling back to our tent, a large master suite with an adjoining room furnished with bunk beds, we tucked the kids in under their mosquito nets and said good night. A big part of the safari experience is sitting in the passenger seat of a truck looking for game, and I find there are few activities more relaxing than leaning back, feeling the warm breeze on your face, and watching the landscape slip by. The next morning, it was time to set out into the bush and get into vacation mode. Selous is very lush, with dense trees and shrubs everywhere; one can only wonder how the Victorian explorers survived out here, hacking through foliage, dodging predators, and getting devoured by mosquitoes and tsetse flies — all in the name of the Queen. Fortunately, in the intervening years the Tanzanian government has put in a network of dirt roads, and after an hour or so of driving, our guide in the Selous, Mashaka John Ngalawa, followed one up to the base of a baobab tree. He started pointing things out, like elephant scratches in the bark and a big beehive lodged in the tree's stubby, rootlike branches. My boys listened attentively. "I think this tree has been here for about eight hundred years," Ngalawa proclaimed, which was entirely possible (some baobabs are believed to be thousands of years old). He drove us closer to get a better look. Then closer still. 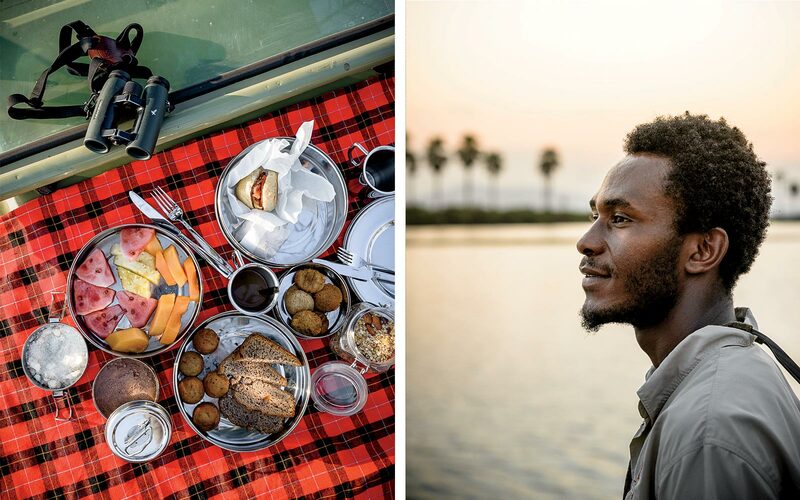 From left: Breakfast served on the hood of a safari truck in Ruaha National Park; Emmanuel Matari, one of Asilia Africa’s in-house safari guides. Suddenly, I saw Ngalawa's face, its expression usually languorous, go into a state of red alert. He gunned the engine, threw the truck in reverse, and raced us backward, crashing over rocks and tree stumps and flattening several innocent bushes. In an instant, a huge swarm had poured down on us in a dark cloud. African killer bees! (Actually, I can't say for sure that they were killer bees. But there were a lot of them — and they were not happy.) Asa, who sometimes speaks in oddly complete sentences for a five-year-old, howled: "I have been stung by a bee, mama! I have been stung by a bee!" Mama vaulted out of her seat to yank out the stinger as the truck roared backward. Shooting a quick glance at Apollo, who had curled up into a ball like a pangolin, I frantically shooed away more bees before they could land. Note to self: don't park under a baobab containing an enormous beehive. We motored back to camp, licking our wounds, and took it easy the rest of the day. Fortunately, we were in the perfect place for that. Asilia does safaris a little cushier than most — though not so cushy you feel like you're losing contact with your surroundings. Our camp had Wi-Fi, a great big wooden bar, a living-room-like tent with a small library, and a swimming pool. Walking back to our tent after an afternoon of swimming and lazing, I was able to appreciate how far out we really were. There was no mechanized noise. The only sounds were our eight sandals crunching through the dirt and the cicadas singing in the trees. The place felt so peaceful, it was hard to reconcile the fact we were actually in the midst of one of Africa's biggest hunting grounds. The Selous is a game reserve, which means that each year, hundreds of animals are legally killed here. If you have the budget, the proper permits, and the correct weapon, you are entitled to choose from a wide menu of wildlife to kill — including the endangered elephant (a successful elephant hunt costs around $100,000). To those of us who cherish wildlife and fear for its future, big-game hunting seems like a sport that should be relegated to the past, particularly in light of the recent poaching craze that has pushed some of the continent's most iconic species closer to extinction. But hunting is alive and well in Africa. Some governments, such as Tanzania's, earn millions of dollars from it each year. Proponents argue that, when correctly managed, hunting can protect wildlife. Responsible hunters, they say, kill only adult males past breeding age, and help scare away poachers. There might be some truth to this; areas where active hunting is taking place tend to be more closely patrolled. Personally, though, I will always have trouble squaring the notion that killing rare animals helps save them. The vast, 19,000-square-mile Selous has been divided into two parts: one for what are called "photographic'' safaris, like ours, and the other for hunters. The hunters' area was miles away, and we never saw anyone involved in the sport. Still, we felt their impact. In three days in the Selous, we didn't see a single elephant. The combination of legal hunting and pervasive poaching has made the reserve's elephants deeply suspicious of man. At the faintest sound of a car or scent of a person, these famously intelligent, sensitive creatures go crashing into the bush. Jabali Ridge, the new Asilia property in Ruaha National Park, is an oasis in the middle of a vast expanse of open parkland dotted with baobab trees. Sitting at the top of a small hill, the lodge is made up of a series of wood-and-stone villas built into the rocks and connected by sleek wooden catwalks. Picture a safari lodge designed by Frank Lloyd Wright and you get the idea. The place is seriously gorgeous. I loved leaning against the railings of the dining area, or just about anywhere on the property, and staring out at the miles of savanna traversed by sandy animal pathways, and the tawny hills beyond. The pool at Jabali Ridge, with the plains of Ruaha National Park in the background. Jabali Ridge is also a well-oiled machine. The camp's manager, Clement Lawrence, is a Namibian with a wry sense of humor and a soft spot for kids. When he heard us musing at dinner about making an early start the following day, he volunteered to organize a bush breakfast for the next morning so we could begin driving at dawn, eating our eggs, sausage, and house-made granola on the fly. When our boys lost a plastic tiger somewhere near the infinity pool, a technician hunted under the deck and found it. The guides were among the best I've ever encountered, deeply knowledgeable about the entire ecosystem, able to track game from a few half-blown footprints, and — perhaps most importantly for our gang of four — incredibly patient. Our kids are bird freaks, and their intensity at times is a little scary. In breathless, earnest sentences, they will talk your ear off about the difference between a pied kingfisher and a malachite kingfisher (they're big on kingfishers these days), or what a saddle-billed stork eats for breakfast. They were born and raised in East Africa and have a much more intuitive appreciation of nature than I ever had growing up in the suburbs of Chicago. I was worried they might wear out our guide, Moinga Timan, the sturdy 24-year-old bachelor who had found the sleeping leopard en route from the Ruaha airstrip. He hailed from a rural Masai area and was, I imagined, probably not accustomed to the high-velocity needs of two American expats' kids. But he couldn't have been kinder, cheerfully grabbing his canvas-covered bird book and thumbing through the pages to answer every last one of the boys' questions. The perfect safari guide has to be a lot of things — driver, tracker, spotter, host, conservationist, conversationalist, mixer of drinks, and master of surprise. Timan was all of those. He let the kids sit on his lap and drive his truck down those long, straight dirt roads. He taught them — and me and Courtenay, too — about how to pay attention to the smallest things and how, by being mindful, you can feel so much more connected to the world around you. Ruaha has done a much better job of protecting its elephants than the Selous, and is one of the last places in Africa where you can still see enormous herds. Unlike the Selous, which is run by Tanzania's notoriously corrupt wildlife department, Ruaha is a national park, and therefore managed by professional conservationists. Although poachers have encroached here, Ruaha has far more aggressive ranger patrols. Near Jabali Ridge we saw a sprawling ranger station made up of a number of low-slung buildings, their metal roofs shimmering under the sun, where dozens of armed figures marched around the complex in camouflage. The battle is far from over, but I got the sense from the guides and rangers we met that, here and elsewhere, the ivory problem is no longer hopelessly out of control. 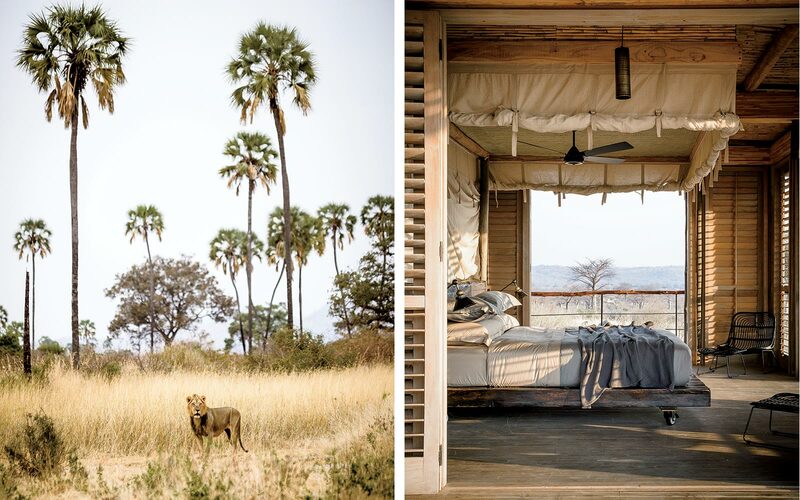 From left: A lion on the plains of Ruaha National Park; a guest room at Jabali Ridge, where materials were chosen to blend in with the surrounding landscape. "Watch how they dig,'' Timan said as we approached a herd of around 30 elephants early one afternoon. We parked a safe distance from where they were lumbering across a dry river. Timan told us that each year Ruaha was getting drier, maybe because of climate change, maybe because of the farms appearing upriver to feed Tanzania's fast-growing population. Elephants have an uncanny ability to detect underground water, and as the herd moseyed past us, clouds of dust lifting under their gigantic feet, one of the matriarchs suddenly stopped. Using her right foreleg, she started digging a hole, pawing a patch of sand like a bull in a ring. She then lowered her head and began scraping with a tusk. The riverbed was bright and hot, a dusty haze hanging in the air, not a trickle of water anywhere. But after a few minutes, the elephant snorted triumphantly and lifted up her trunk. Its tip was dark gray with moisture: she had found water. Other elephants trotted over and began digging with their feet. As we watched them take turns drinking out of the ground, I was humbled. If it had been left to me to find water out there, we would have all died of thirst. On our last afternoon, Timan caught us lounging in the dining area and said: "What do you guys think of a night safari?" Leaving the camp in the fading light, Apollo spotted a bird perched on top of a mahogany tree. "Is it a lapwing?" he asked. "Just look, look at the details," Timan said. "Look at the beak, the plumage, its eye color. Take it slow." Apollo lifted the binoculars to his eyes and studied the bird for a moment. As the sun sank behind the hills and night rose up around us, we drove into a small forest, looking for a lion pride another guide had spotted earlier in the day. After a few minutes, Timan seemed to sense something. As he shined a light across a tangle of dead bushes, a dozen bright green disks stared back. Six lions, each with a muzzle soaked in blood, were chomping on the carcass of a giraffe just a few feet from us. It was an extraordinary sight: eerie, fascinating, and unforgettable. After watching for a few moments, we drove away, leaving the pride to enjoy their meal in peace. On the way home, I asked Timan if there was a place we could stop and stargaze. Next thing I knew, he started peeling back the truck's canvas roof, opening up a spectacular night sky smeared with stars. We stood up and listened as Timan pointed out formations I had only ever seen in books. The constellations were so clear, the sky so black. From somewhere in the bush came the sweet, light perfume of a plant that I guessed must be a cousin of jasmine, blowing on the warm night breeze. As we drove quietly back to camp, our two headlights punched holes through the dark. 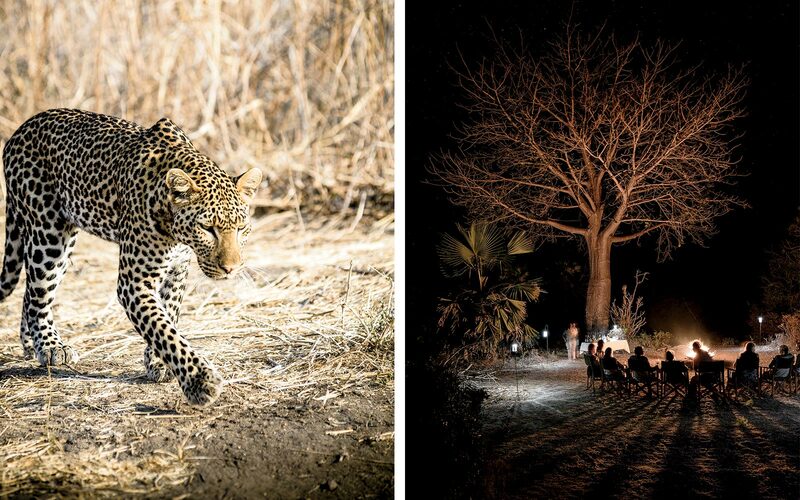 The poachers, the ivory trade, the population pressures, climate change — they were all obscured by the darkness and the overpowering sense of Ruaha's immensity. I looked out at the starlit savanna and over at my kids just soaking it all up and couldn't help thinking, Why, exactly, did we have to leave? Might there be a way to make a life out here again, one day? Here's how to make the wild, unspoiled Selous Game Reserve and Ruaha National Park your next safari destinations. the airport by applying in advance through the Tanzanian embassy. Fly into Dar es Salaam's Julius Nyerere International Airport through major hubs such as Amsterdam and Doha, Qatar. From there, your tour operator can arrange a charter flight to the Selous Game Reserve or Ruaha National Park. Asilia Africa is a Dutch-run safari operator that focuses on East Africa and emphasizes ethical and sustainable tourism. The company has a total of 12 camps in Tanzania. 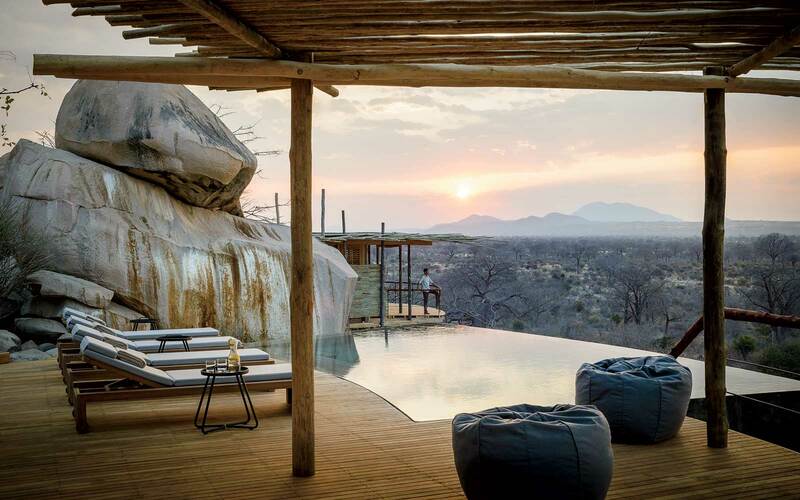 Jabali Ridge: The eight Modernist-style bungalows at this new Asilia lodge are designed to blend into a towering granite boulder in Ruaha National Park. Track leopards and elephants on game drives led by passionate local guides, and enjoy amenities like a "bush bonnet" breakfast while out in the field. doubles from $1,577. Roho ya Selous Asilia: Africa's just-opened second camp consists of eight tented platforms, each with hand-carved wooden accents and a private veranda. Meals are served alfresco, and feature East African specialties like Zanzibari snapper. doubles from $1,400. Deeper Africa: A two-time T+L World's Best Awards winner, this trusted safari operator offers Tanzania adventures like lion-spotting excursions in Ruaha and cruises down the Selous's Rufiji River, home to hippos and crocodiles. 10 nights from $8,445 per person. Extraordinary Journeys: This boutique tour operator specializing in East Africa is run by mother-daughter duo Marcia and Elizabeth Gordon — recently featured on the A-List, T+L's annual roundup of the best travel advisors in the business. Ruaha and the Selous are some of their many Tanzania offerings. 212-226-7331; elizabeth@ejafrica.com.